Zahabiya Water Shield ZSAC-10/55 is acrylic copolymers based ready to use waterproof & vapour barrier liquid membrane coating. 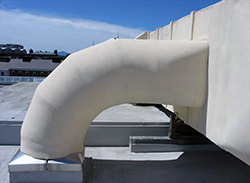 In the HVAC industry, this “Human Friendly & Environmentally Acceptable” product finds many utilities such as coating over the lagging cloth for pasting various layers together; washable, vapour barrier & anti-fungus paint for the protection of cloth & duct jacket from the harmful atmospheric effects and as an adhesive & protective finish for thermal insulations on hot/ cold water pipe fittings, vessels and other process equipments. ZSAC-10/55 is the best coating to protect delicate insulating materials from UV and other environmental effects. Due to excellent waterproofing and vapour barrier properties the product can be safely used in areas where relative humidity exceeds 90% for continuous periods or where the insulated piping or equipment contains chilled water, brine or refrigerant. The product conforms to the VOC requirements of LEED IEQ 4.2 – Low Emitting Materials: Paints & Coating and Green Seal Standard GS-11. Hot/ cold water & oil proof. Vapour barrier & air/ gas tight. High elongation and tensile strength. Soft touch & abrasion resistant. Zero (0) fungal growth (ASTM G21).